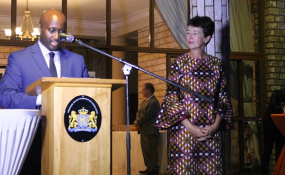 Olivier Nduhungirehe, the Minister of State in the Ministry of Foreign Affairs, Cooperation and East African Community speaks during celebrations to mark the Dutch King’s Day on Friday as Dutch envoy to Rwanda, Fredrique de Man, looks on. Rwanda and the Kingdom of The Netherlands have pledged to maintain strong ties with emphasis on investment, officials from both countries have said. They were speaking during celebrations to mark the Dutch King's Day at the Ambassador's residence in Nyarutarama, a Kigali suburb. Over the years, several Dutch companies have invested in Rwanda, including Heineken, Royal DSM that holds the majority shares in Africa Improved Foods Company, Unilever in Tea processing and KLM Airlines. Also, a recent Horticulture investors' conference led to a contract between a Rwandan horticultural company and their Dutch counterparts to supply year round fresh vegetables. The Dutch envoy to Rwanda, Fredrique de Man, said that there is need for the two countries to further strengthen their cooperation on trade and investment. "These are exciting times for doing business in Rwanda. And at the embassy we are looking forward to remain in constant dialogue with the Rwandan authorities and the business community on intensifying our commercial exchanges and on the transparency, clear procedures, the level playing field and the innovation and creativity needed to achieve this." "At the same time, we highly value the great work of civil organisations who keep us, Rwanda and the Netherlands, 'awake' on a wide range of societal challenges," she said. In his remarks, Olivier Nduhungirehe, the Minister of State at the Ministry of Foreign Affairs, Cooperation and East African Community, commended the Dutch support in Rwanda's development over the last 24 years and pledged continued commitment in the cooperation. "Rwanda and the Netherlands have forged a strong and principled partnership. Over the last 24 years, the Netherlands has continued to be a strategic partner and is playing a vital role in the Justice Sector." "Trade and investment between our two countries are also growing progressively. Several Dutch companies have their presence in Rwanda... several others have shown interest in investing in Rwanda, and we are hopeful that more ventures will materialize," he said. He added: "I am confident, therefore, that our bilateral relations and people to people interactions will expand as we continue to cultivate partnerships to the mutual benefit of our peoples". The Dutch King's Day is a national holiday in The Netherlands and is celebrated every April 27. It's the day that the Dutch King Willem-Alexander was born - in 1967.